What does “noble” mean to you? To TransAm Trucking, it means acting with integrity and going out of your way to help others. We believe the trucking industry is a fraternity focused on serving the American public. 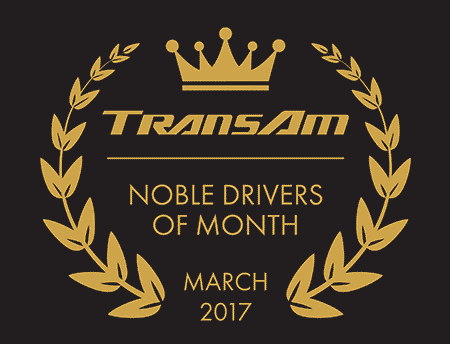 March’s Drivers of the Month all went well above the normal call of duty to help someone in need. Thank you to each of the March winners. We are glad you chose TransAm Trucking. Ray Nolin is very active within the TransAm Trucking community. He is a coach, a representative at job fairs, and a recruiter for TransAm Trucking at CDL schools across the country. Ray does it all, including being a big advocate for safety. His driver manager says, “he has actually given me safety advice numerous times to share with the fleet.” His enthusiasm for sharing his knowledge with others is well known. He keeps copies of his pre-/post-trip checklist tips and gives copies to his students and other new drivers. He is a candid individual with a reputation for giving honest opinions and advice on the trucking industry to anyone who asks. Jaime is someone you can count on to get the job done. His reputation and positive attitude are well known around the office. Jaime truly enjoys his chosen career. He volunteers to work on the weekend and runs his loads safely and on time. Time management is one of his strong suites and he is willing to offer advice to anyone who needs it. On several occasions, he helped his co-workers with paperwork and log questions. We are glad Jaime is part of the TransAm Trucking team. Mentor of the Month – Fredrick Best Jr.
Fredrick is a strong believer in first impressions. When on the Yard, he makes a point to talk to the new student drivers. He is welcoming and approachable, answering questions whenever someone asks. He treats people like family. Recently, he put this principle into action when an unforeseen incident cut his student’s over-the-road training short. The student needed to go home, so Fredrick drove him all the way to Chicago where the student made plans to meet up with a family member. Fredrick did not ask for anything, he just did what needed done. We thank each of these drivers for choosing TransAm Trucking. Your contributions to the trucking industry are inspiring. Congratulations on your achievements!